A pair of researchers, one with the University of Maryland the other with Southwest Research Institute, has found what they believe is a plausible explanation for the existence of the ocean beneath the surface of one of Saturn's moons. In their paper published in the journal Nature Astronomy, Marc Neveu and Alyssa Rhoden describe the computer model they built to replicate conditions near Saturn over time and what they showed. Saturn has over 60 moons, ranging in size from tiny globes less than 300 meters across to the giant moon Titan, which has a larger circumference than Mercury. Some of the moons orbit close to the planet, others quite far away. 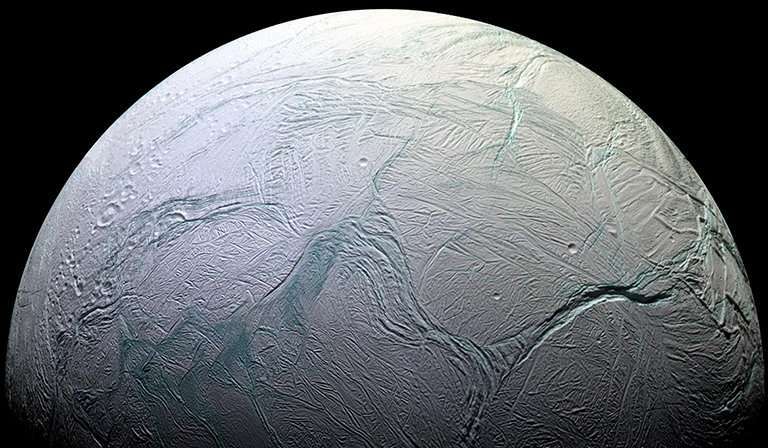 Scientists believe that only one of Saturn's moons, Enceladus, has a subsurface ocean. In this new effort, the researchers sought to determine why Enceladus is unique in the Saturn system. The researchers started by noting that Saturn has just five inner moons, each of which is large enough to have a subsurface ocean and close enough to the planet to melt ice. They also noted that prior work by others has suggested that all of the inner moons likely developed as a result of coalesced material pulled together from debris around the planet, which would have included ice. They also noted that all five of the moons are impacted by the gravitational pull of the planet, and from one another. And finally, they noted that prior researchers have created computer models meant to mimic the tides on Saturn's moons and their geology, but to date, no models had been created to model both—the only kind of model that might explain why only one of the moons has a subsurface ocean. The researchers designed their model to mimic the behavior of Saturn and its moons over the course of the past 4.5 billion years. The model showed that Enceladus developed a subsurface ocean because of its unique gravitational interactions with the other moons—they forced Enceladus into an oblong orbit. They also found that Saturn's pull on the moon continually distorted it, and that the flexing heated the moon's interior, allowing the water underground to remain liquid. None of the other four moons had conditions similar enough to allow water to remain liquid beneath their surfaces. Well, yes, but AFAIU they also derive that Mimas is a young (and undifferentiated) moon formed after the relatively recent ring formation, while Enceladus must be as old as Saturn itself in order to have its ocean. This means the ocean can be much older than the ring system, which earlier was a putative age constraint.